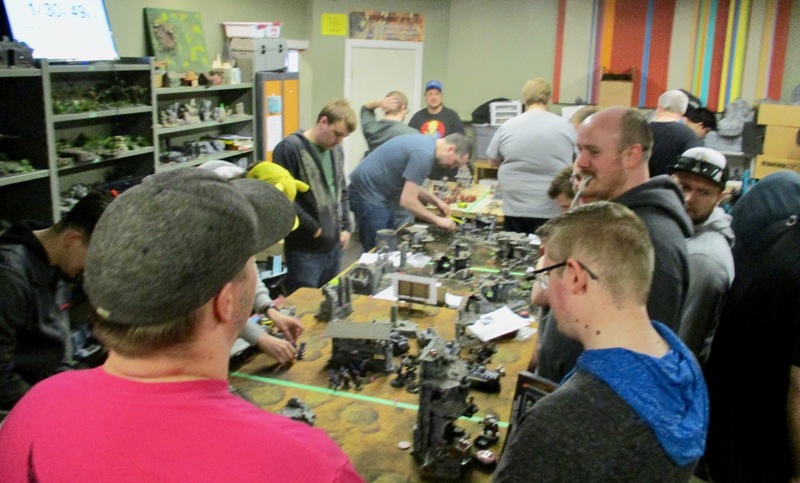 It was pretty crowed back there... and this is before the War Wars: X-Wing guys showed up! I think there were around 24 players....? 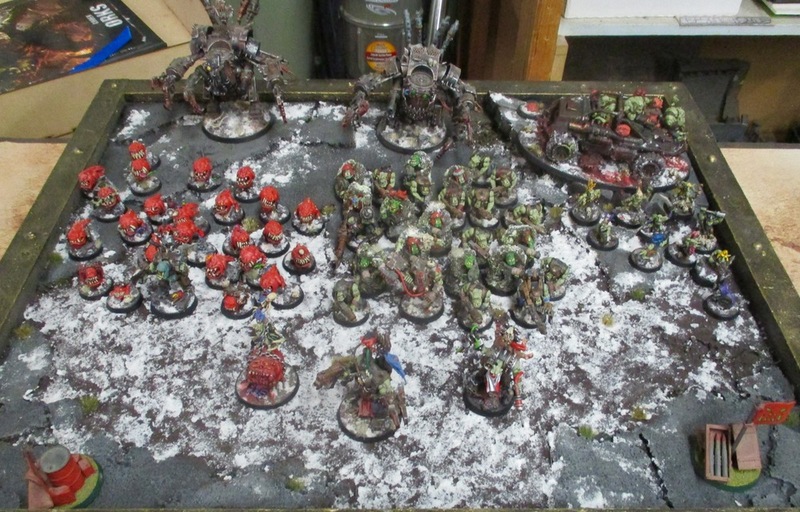 After the first round there was a break for lunch and everyone put out their armies on display. Last year I was the only one that brought a display board - this year, a lot of others had them! 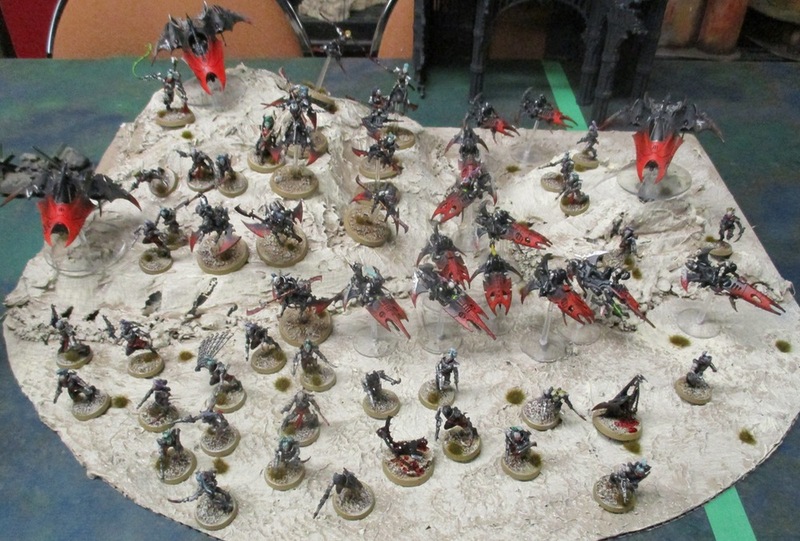 So many great armies! 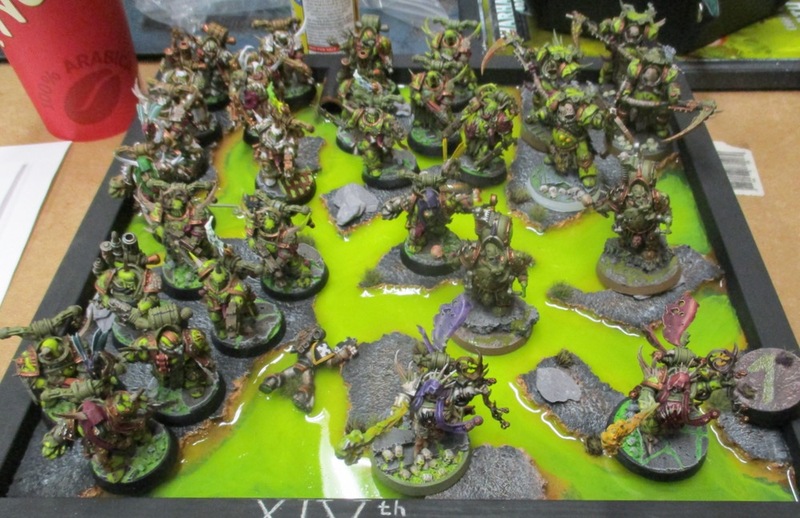 This was one of my favourites: Chad Jordan's Death Guard! SO maybe 7 chaos...? about a third of the forces...? 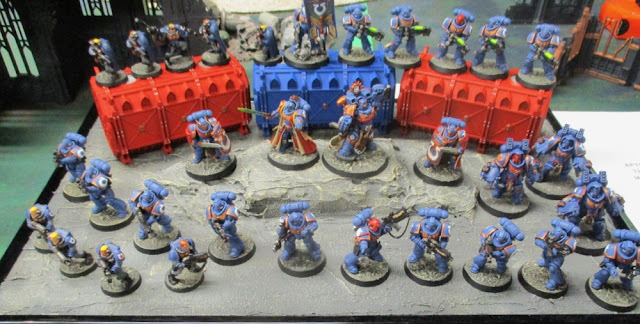 Ultramarines! 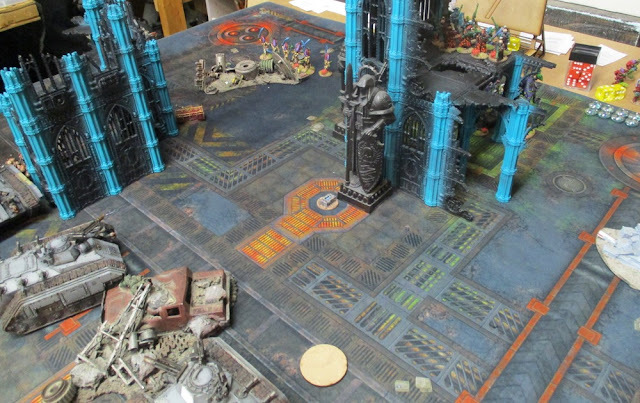 I think there was at least one other Ultramarines player - or maybe Crimson Fists...? 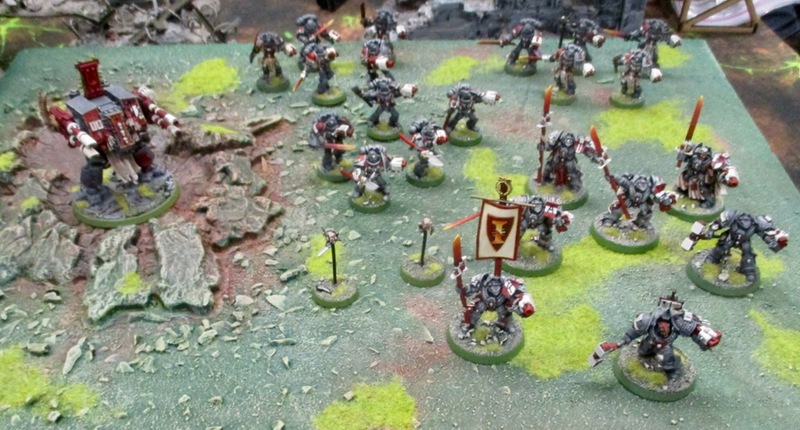 This is a terrible picture - I took three and they all ended up super out-of-focus - but I had to include it because it was an amazing force of Grey Knights with a fantastic display board! 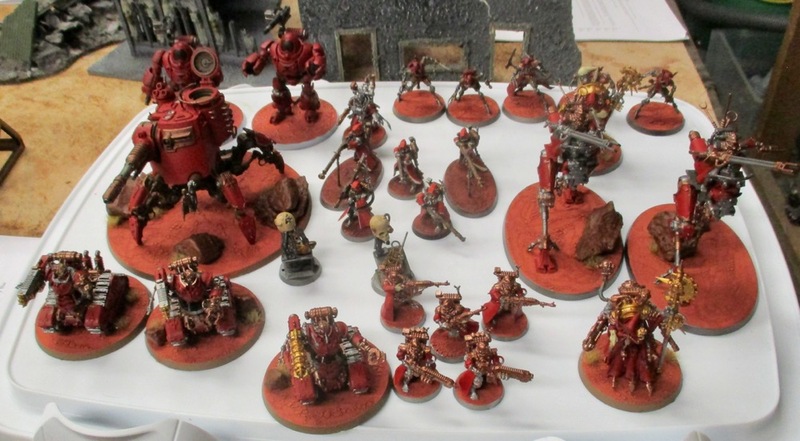 Adeptus Mechanicus - Mark's...? Maybe...? 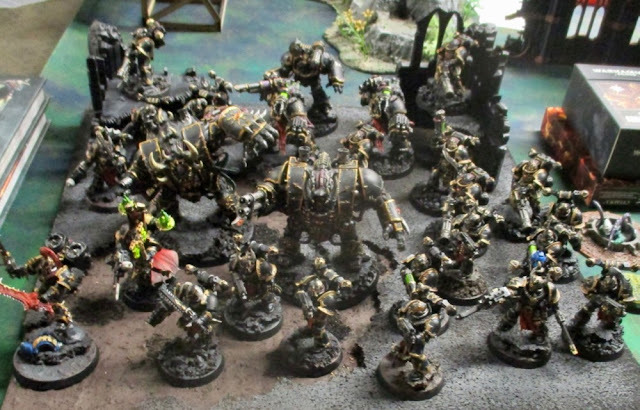 More Ad Mech... that look like maybe they've been adapting Necron tech...? There were two guard forces. This one I took a picture of still out on the table. Same force on it's display board. 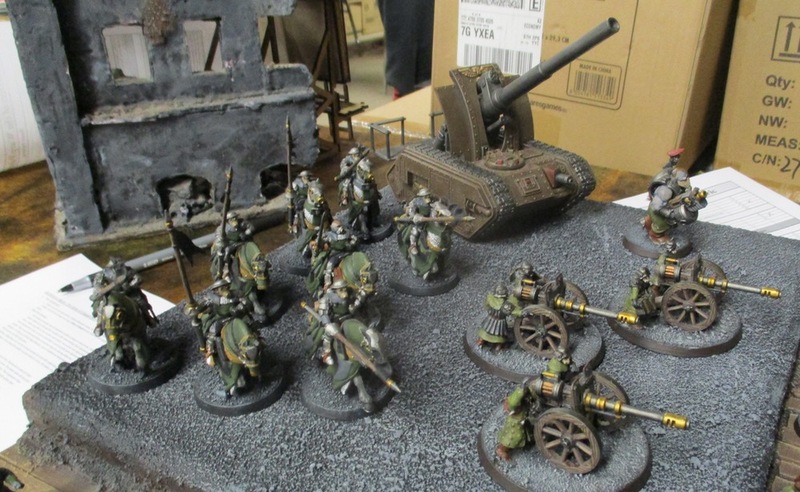 Roughriders and cool heavy weapon teams. 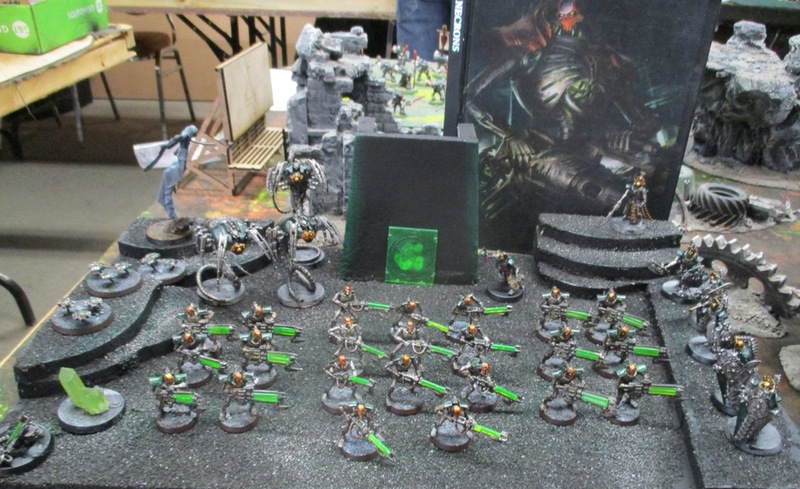 There was another fantastic Guard force - that, for some reason, I didn't get a picture of on it's display board...!? 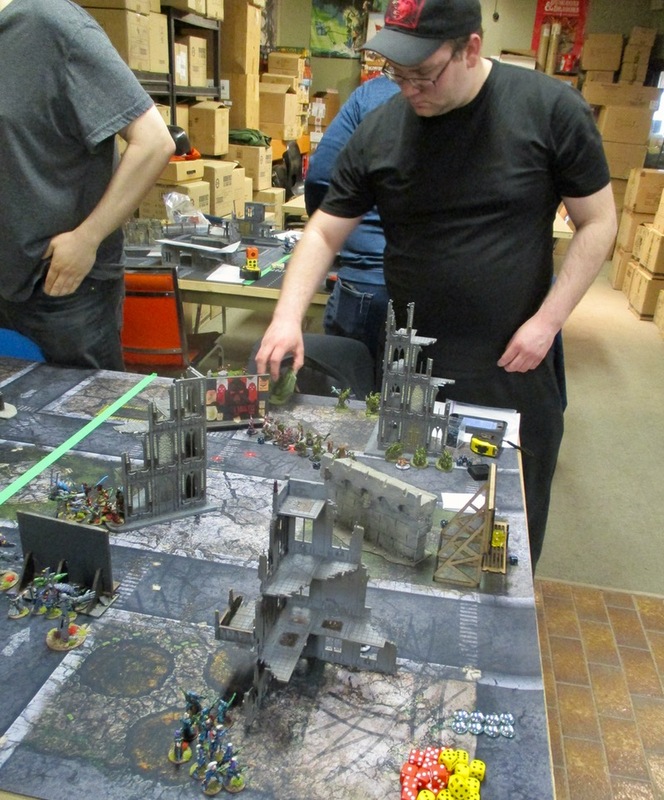 Luckily I got to play against him in Round Two - so you can see some of his force there. Cody's Orks - they won for best painted. 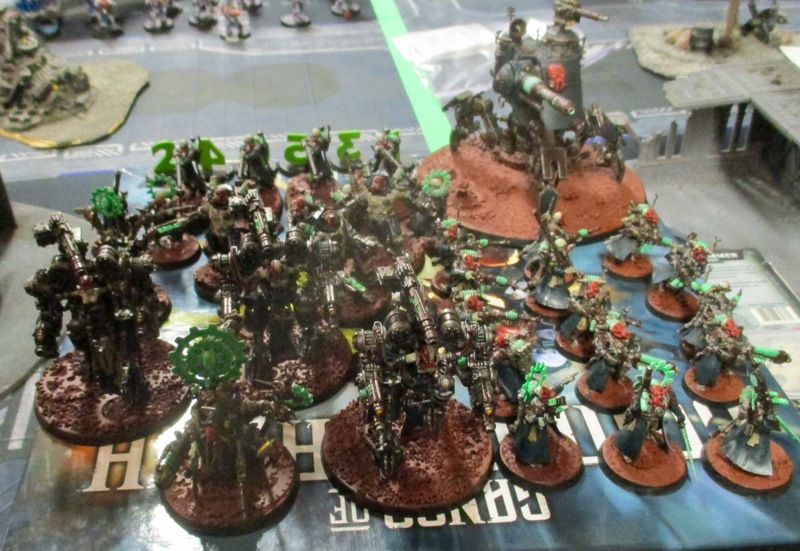 Zack's Drukhari - the only other Aeldari player... This was one of my favourites. My first game was against Death Guard, played by a fellow named Oren. 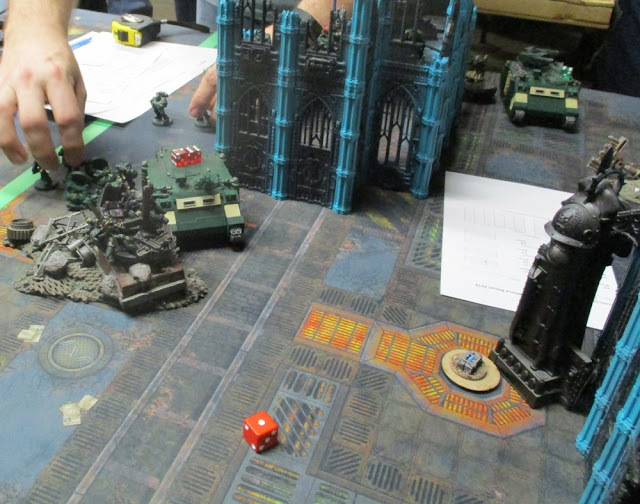 This was Mission #1 that I'd played with Other Tim a few weeks back. 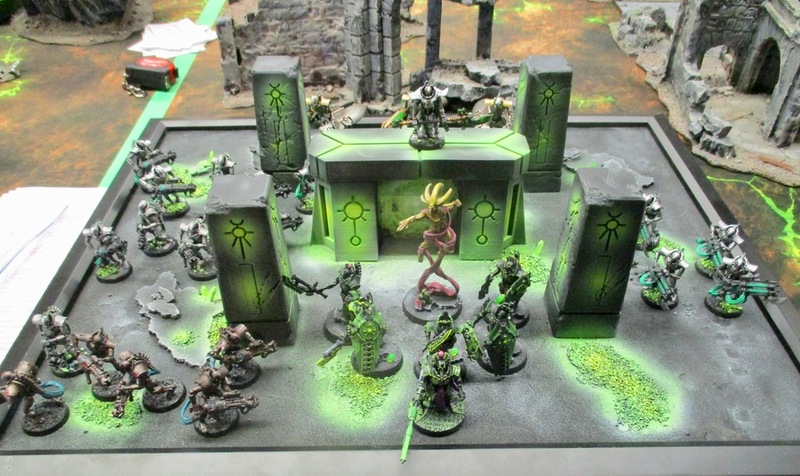 Oren setting up his Death Guard. A good chunk of my force holding back and holding an objective - and denying the enemy space to deep strike into with their Terminators. 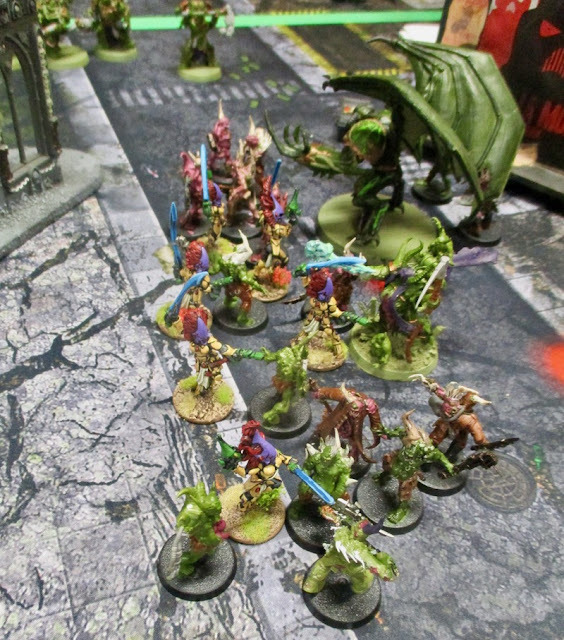 Ahead of them were Banshees and Rangers, supported by another Wraithlord, preparing to move forward to contest one of the Enemies objectives. 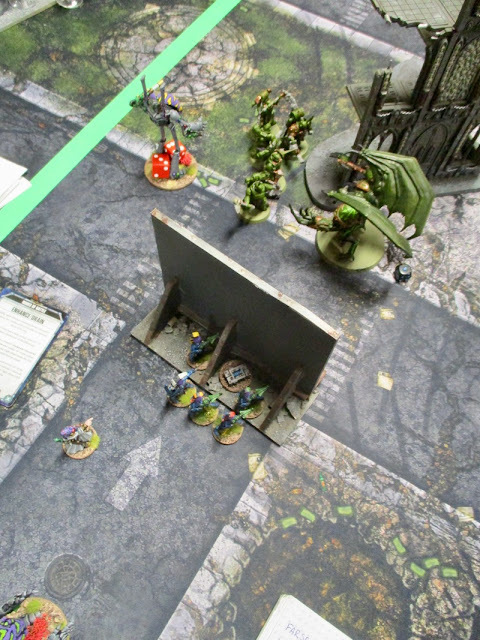 Off to the right was another group of Rangers and Dire Avengers and a Warlock that were going to move forward to secure another objective. Chaos Rhino moved up - the death Guard within were forced to debuss when fire from two of the Wraithlords blew up their ride! Taking a couple with them! 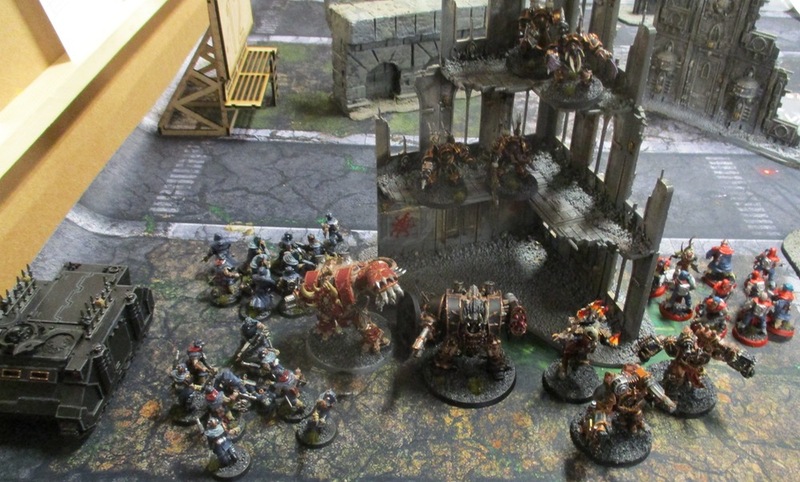 Banshees move out charge the Pox Walkers and Warp Spiders arrive in the back corner of the table hoping to seize the objective held by the Nurglings. The Banshees charge out from cover - preparing to charge the Pox Walkers, they spray them down with their Shuriken Pistols. In they charged hacking and slicing the fowl, wretched creatures. 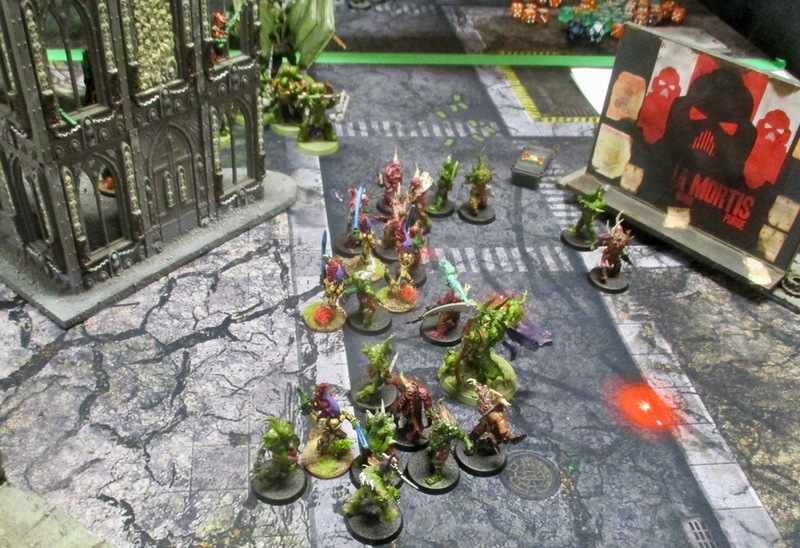 Despite the grace and skill and brutally sharp power-swords of the Howling Banshees, the pox walkers were tough and there were just too many of them! 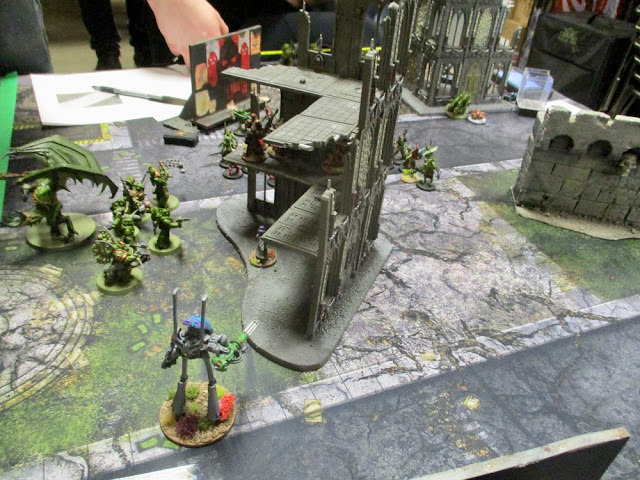 My Warp Spiders did move up and shred the Nurglings and Seize the objective.... and then the game was called on time. We'd very nearly finished the third turn. 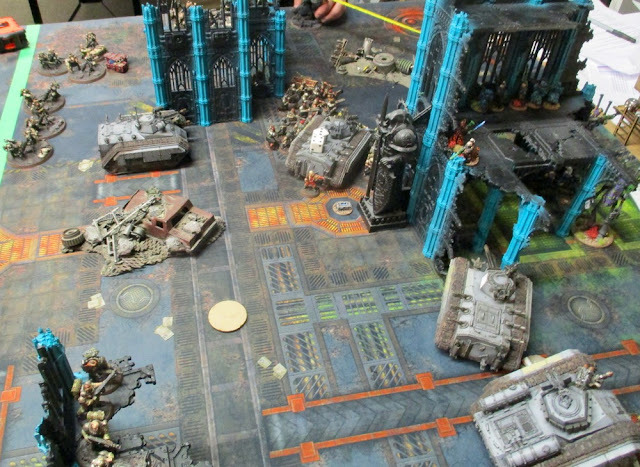 has we finished The Terminators might have taken their objective back... as it was the game was a draw - both of us scoring 8 victory points. 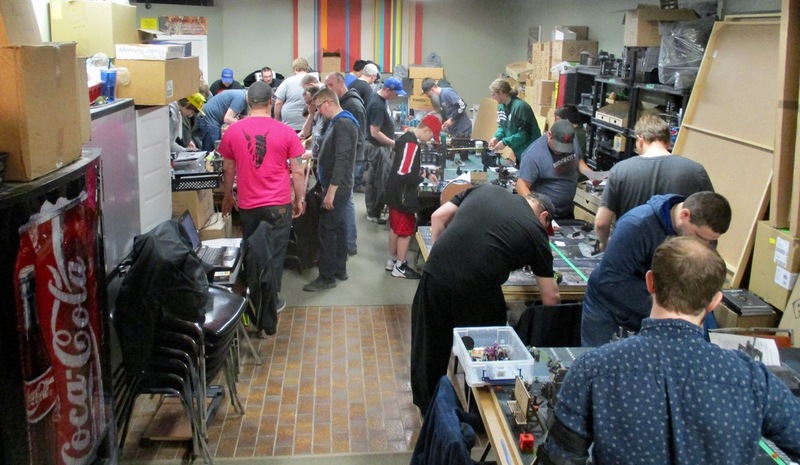 After a bit of a lunch break we were back at it. 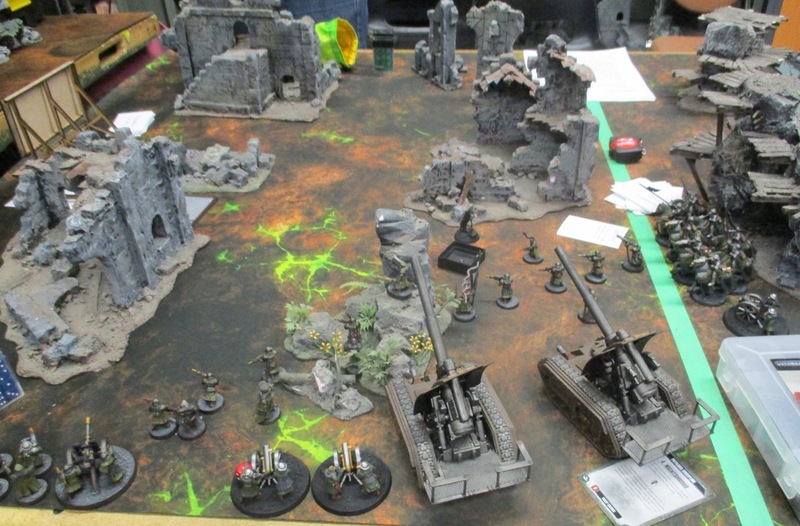 I got to play Alex, he was one of the Imperial Guard players that came up from Regina (270km). He had a really fun army - though he was using the rules for Imperial Guard, there was a whole mess of converting going on and the fluff was that it was a Rogue Trader and his retinue! There were two "Company Commanders" - I think they were both "Arch-Militants" - commanders of the Rogue Traders personal forces (The Rogue Trader was, I'm guessing, still aboard his or her ship). There were a few Veteran Squads that were listed as "mercenaries". So fun! I LOVE armies with fluffy backstories! 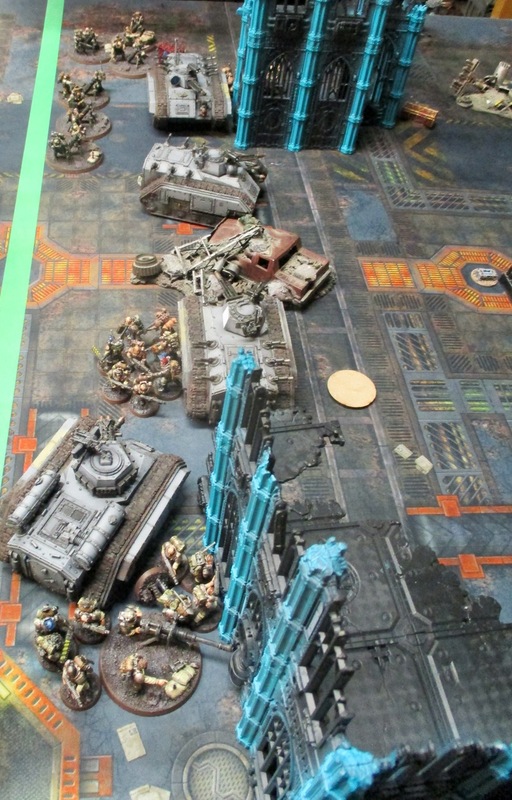 Well, this time it did... and I'd kind of set up stuff in the open assuming I'd be going first and would be able to surge forward to seize objectives.. In the middle, Rangers were set up to dash to good firing positions on the second floor of a ruined building. 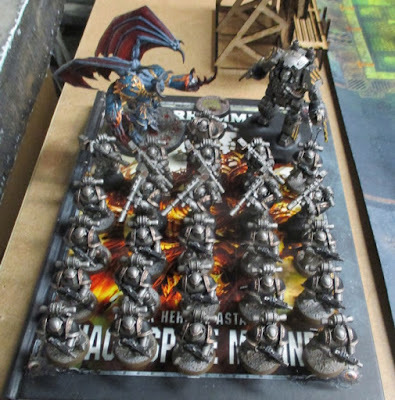 Rogue Trader's troops deploy in Chieras - supported by a Hellhound. Banshees feeling pretty exposed out there... Yikes! 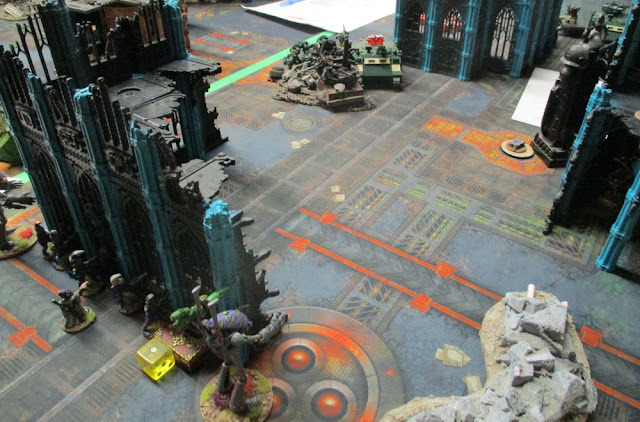 chimera and Hellhounds crash forward following the sentinel - all bringing down fire on Dire Avengers caught in the open (thinking they'd get to go first and get a chance to dash for cover!). 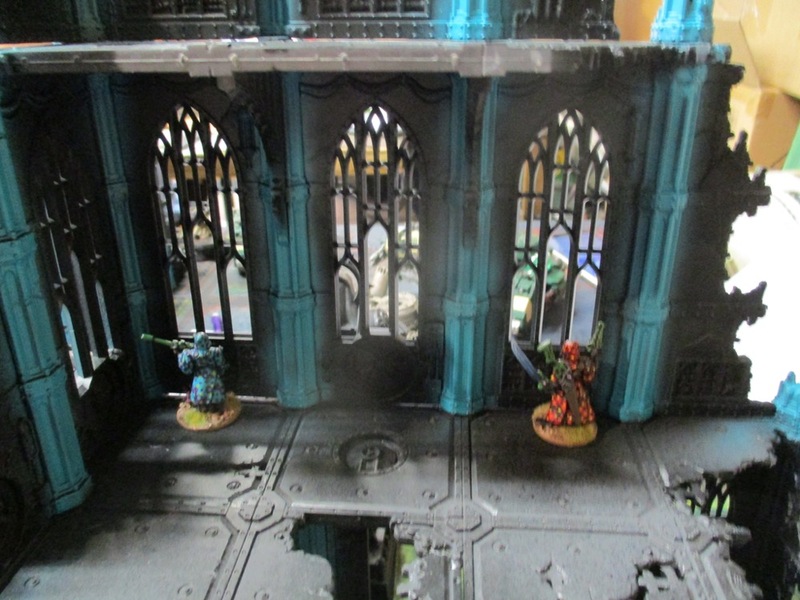 A squad of troopers deploy into a ruined building. 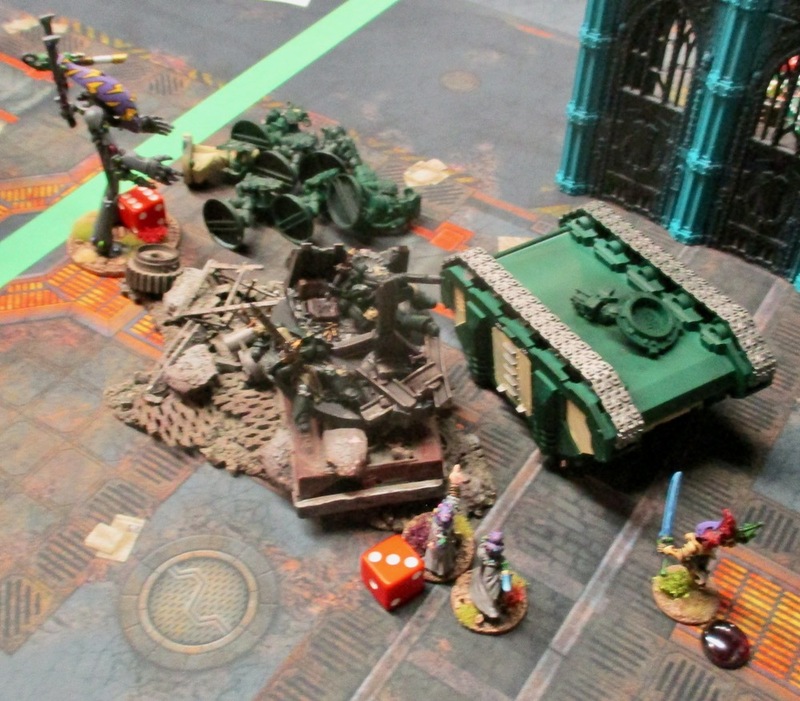 Chimeras and Hellhound surge forward again. Troops debus from some of the Chimeras. 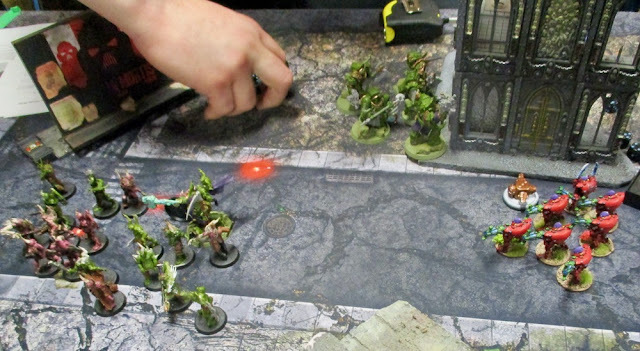 Al Bring withering fire down on the Eldar. 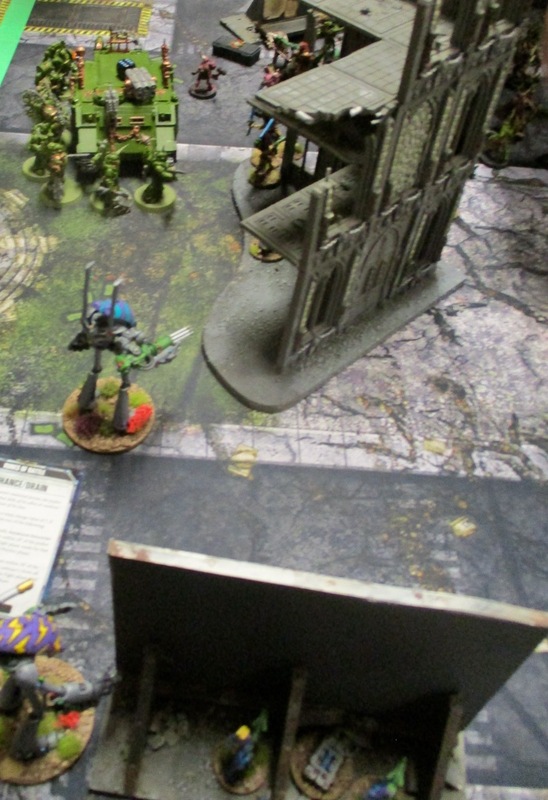 Mortars rain down fir on the Eldar too. The Chimera poking it's nose into a building caught one of the Warlocks unprotected and blew him away. It was a slaughter. I think the game ended 16-8. 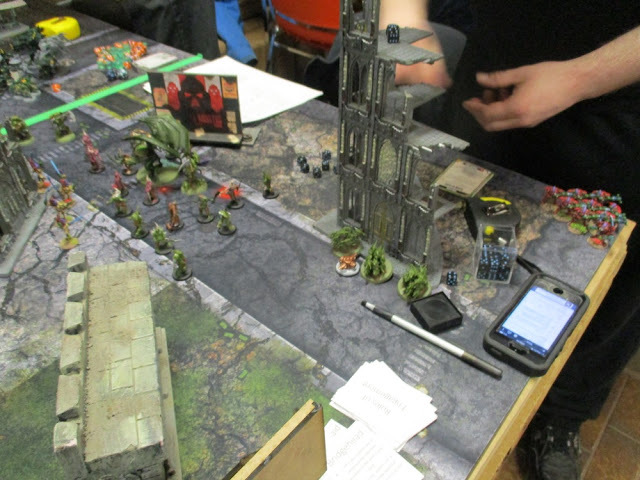 But Alex was super fun to play against and his army was pretty rad. So it was really kind of a win in my books! 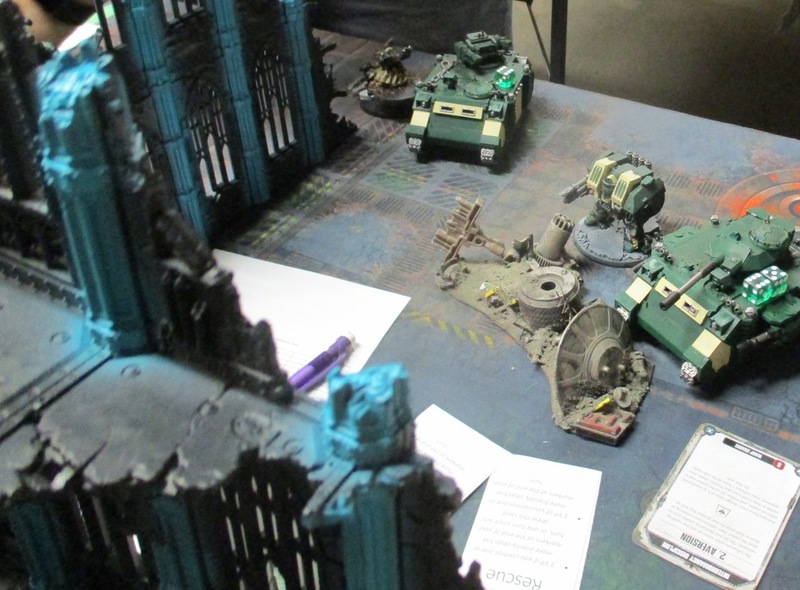 Strangely I ended up at the same table for Round Three - though the mission and deployment zones were different. 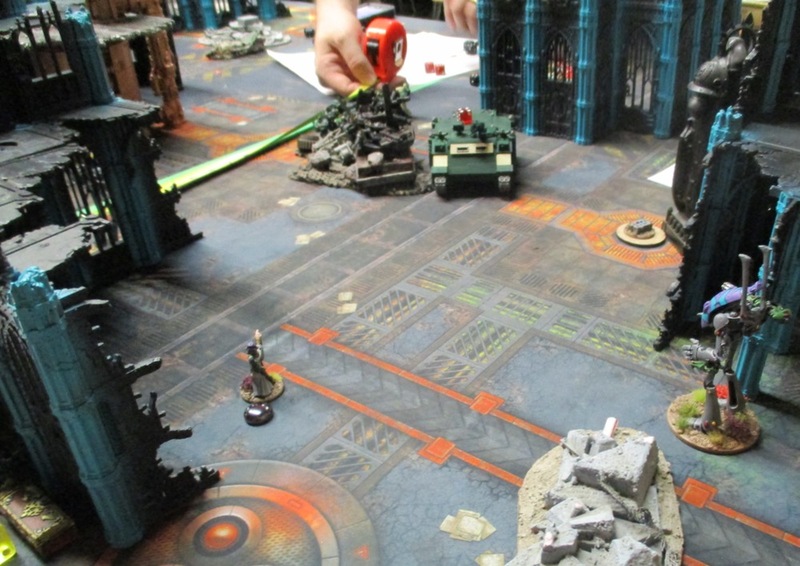 I played a kind fellow named Beau and his Dark Angel Space Marines. 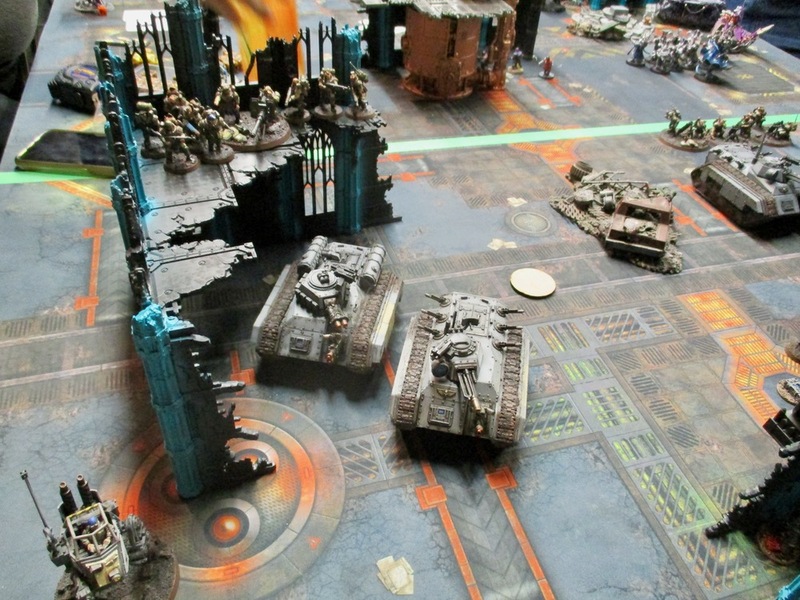 Once again my largely infantry-based force was facing and armoured onslaught. 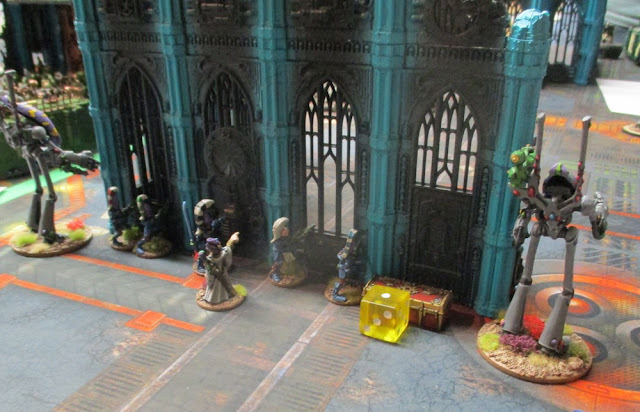 My Farseer started out in cover with one of the Dire Avenger Squads and two flanking Wraithlords who tried to pout fire down on the Marines armoured vehicles. The yellow die is to mark how many turns the objective has been held - they were worth more each turn the longer you held them. The rest of the force was on the right flank and surged forwards on the first turn to take up positions in a ruined building and secure a second objective. 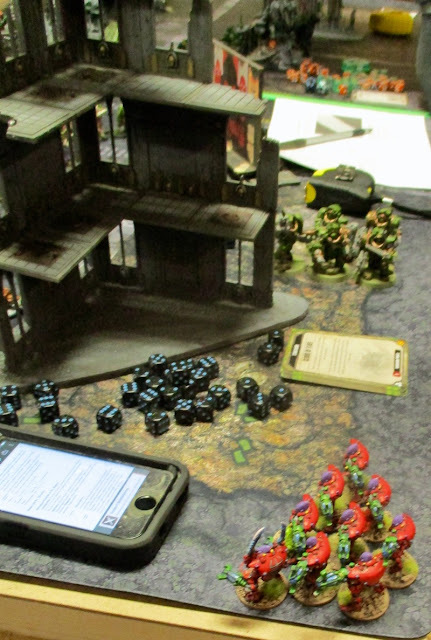 During the Marines first turn they'd nearly wiped out the Ranger squads. One had a single ranger remaining, the other had three. 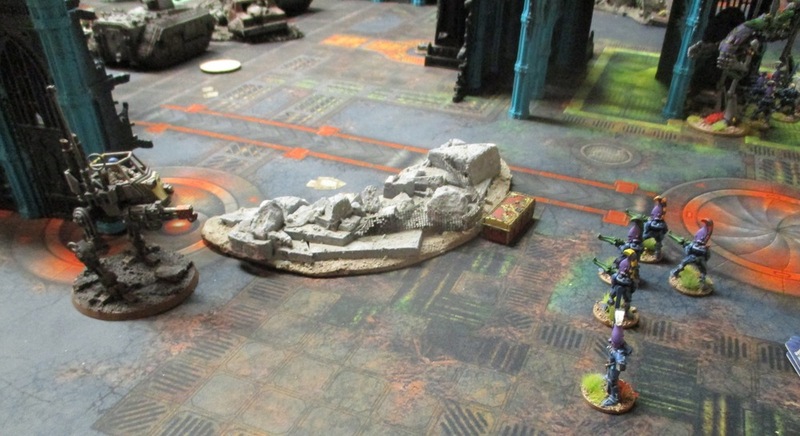 Marines debus from a Rhino to secure an objective. Wraithlords exchange fire with the Marine armour. 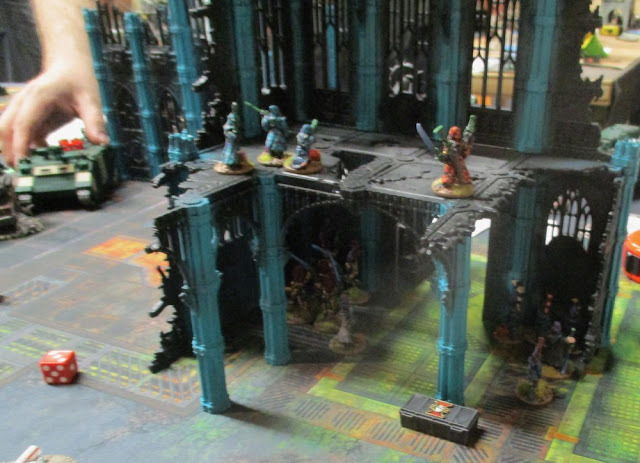 Eventually the Farseer lead the Wraithlords out to advance on the objective held by the marines - one of the Wraithlords was destroyed, leaving the Farseer exposed. He took some fire, but survived. 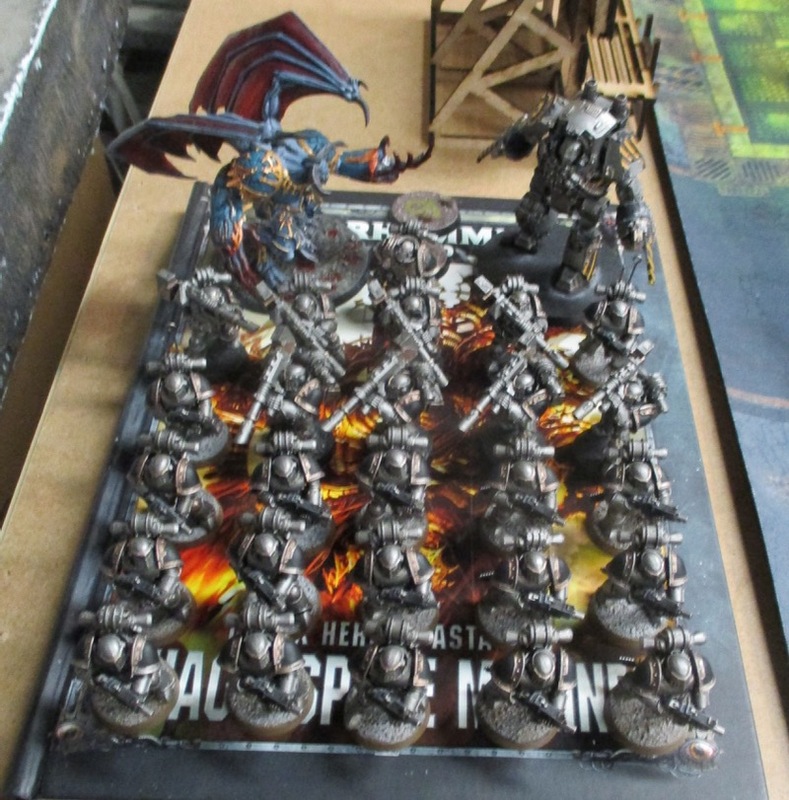 Ranger squads reduced to a single member each by the time they got into position (Should have kept them 'in the shadows"... or... whatever their Deep Striking ability is called...). For the rest of the game they took pot shots at the Marine Snipers in the ruins across the way. 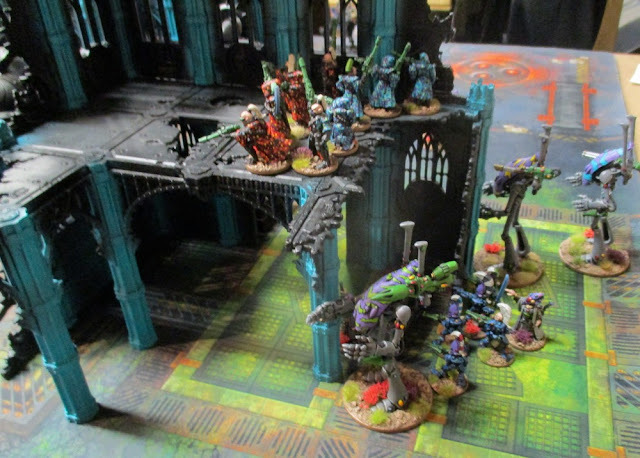 One Wraithlord charged the unit of Marines, another, along with the Farseer, a Warlock and the remaining Howling Banshees charged the Rhino. 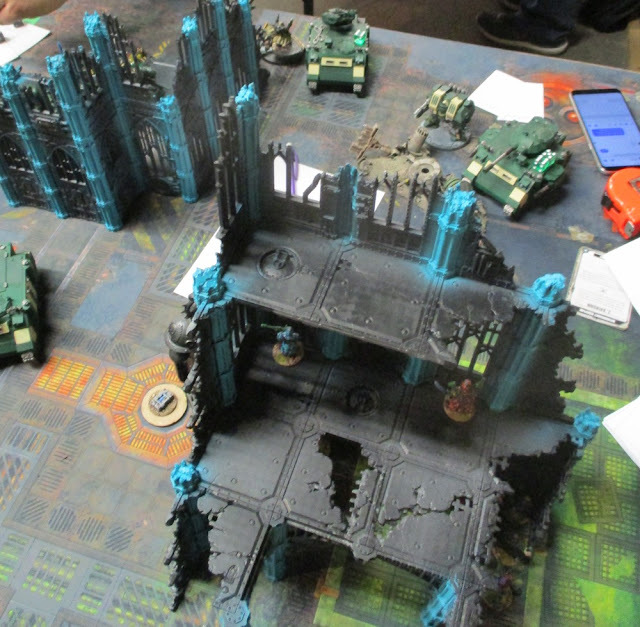 A Wraithlord was lost, and a Banshee or two, but the Rhino and Tactical squad were taken out of action. 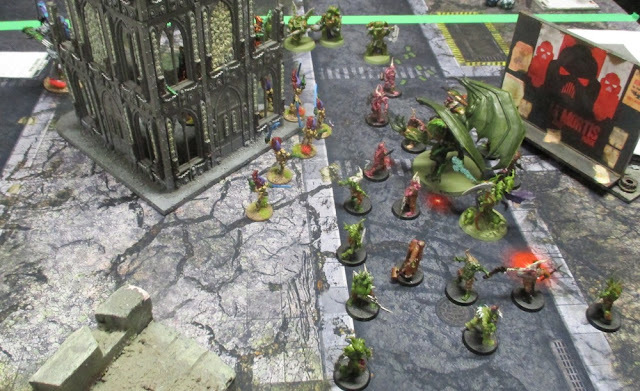 I totally forgot to bring the Warp Spider on in the second turn... and then forgot again in the third, until after I'd started shooting, but Beau was kind enough. to let me bring them on. 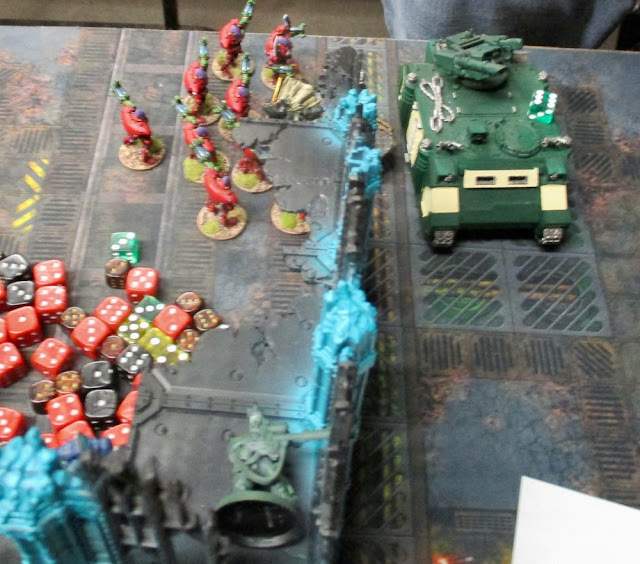 They did some damage to this armoured vehicle... and I think they took out a smaller Tactical Squad of five marines...? By the fourth turn they were on the furthest objective. I think I actually squeaked a win out in this one. 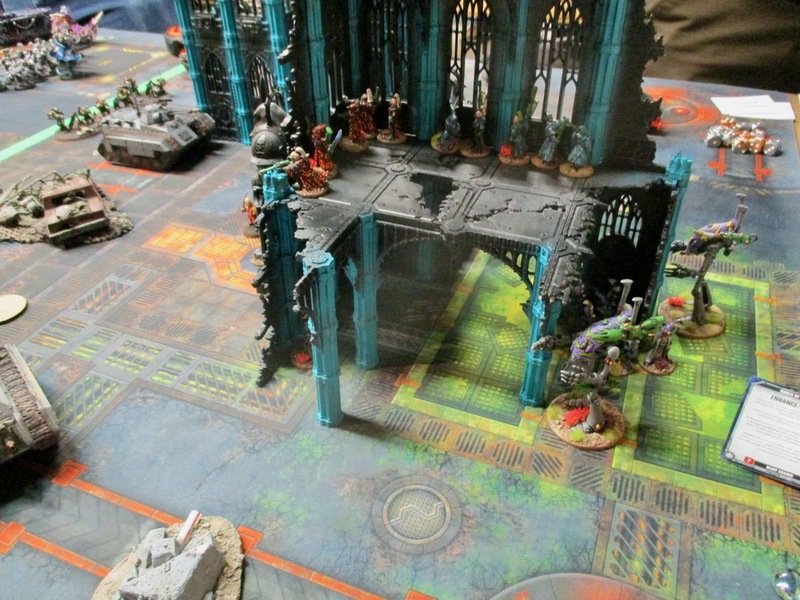 But more importantly, had fun - there was a lot of back and forth in this game. All in all, a very good day - lots of fun was had - though it got pretty warm in there and my feet were super sore at the end of the day from all the standing around. 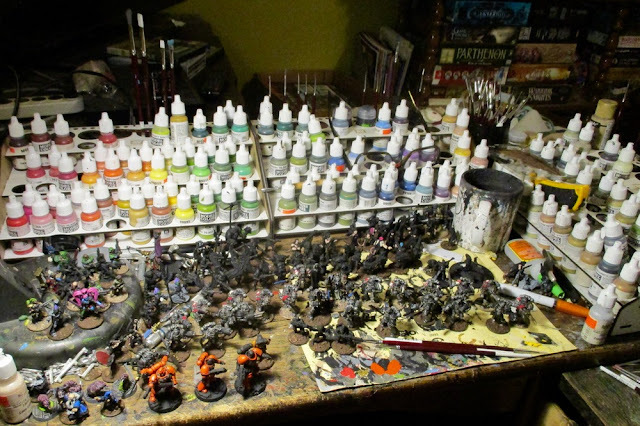 I probably should try and add a second heavy weapon to each of the Wraithlords. 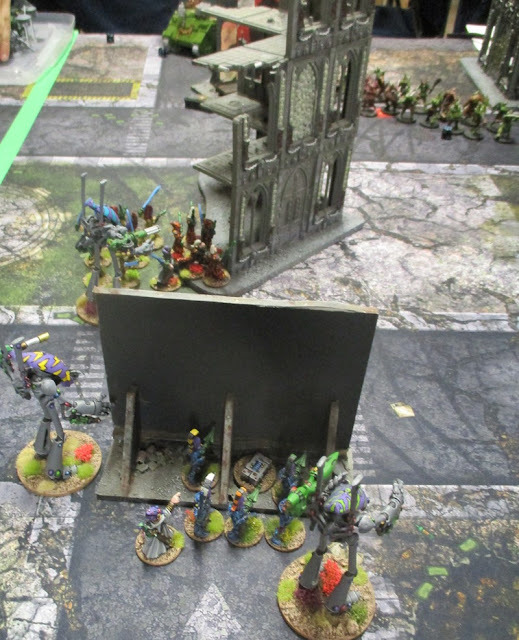 I should probably keep the Rangers off table in the future and just set them up somewhere on Turn Two where they can do something useful. All they did in the first two turns of these games was get shot trying to move into position. I need more Banshees - like a full squad of ten... and keep them out of harms way right until they can charge! 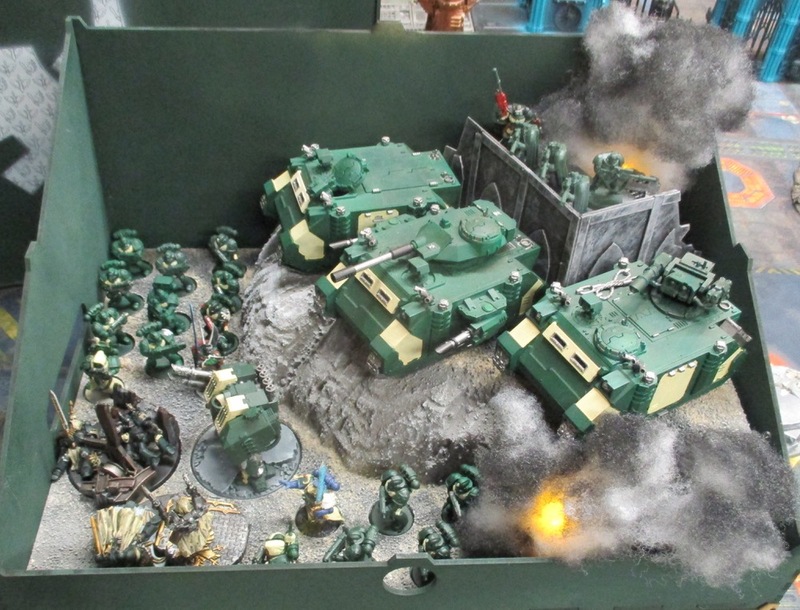 I'd like to paint up and try out my striking scorpions at some point. the next post will probably a few odd and sundry items that I've had finished for some time... the Grey Knights all completed... then...?